Hello friends. I’ve just returned from a weekend concept ride I’ve been plotting for the past year. It involved a 134-mile mini bike tour from Washington, D.C., out the C&O to Harpers Ferry, West Virginia, and the Freedom’s Run marathon. I don’t know what I was expecting, but what I ended up with was a satisfying fall weekend full of movement that was also 100 percent car-free. The perfect eventure. Given that Freedom’s Run begins very near the C&O, this marathon sets up well as a weekend bike tour-marathon combination. After years of randonneuring, bike touring, and running, I wanted to see what would happen when I combined aspects of all three in some way. Multi-day event? Randonneuring. 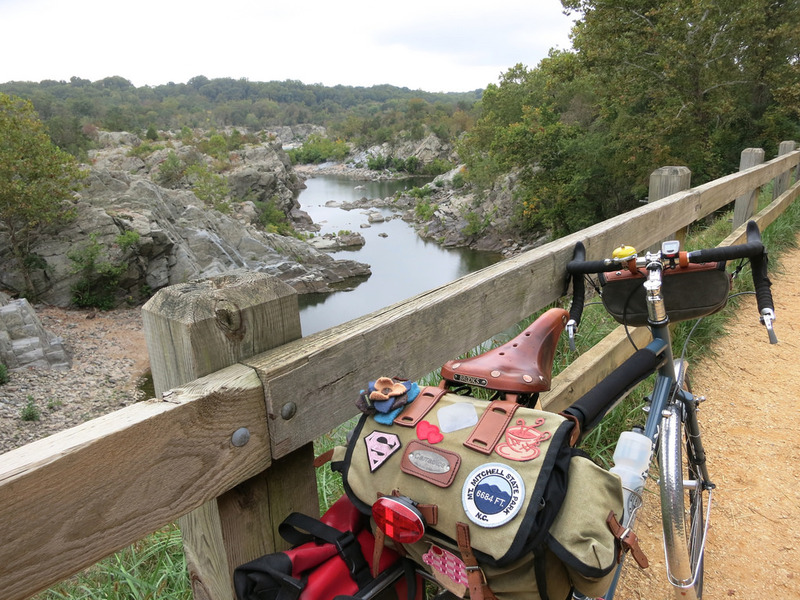 Out and back on the C&O? Bike touring. Marathon in the middle? Running. One part organized event, one part my own informal thing. And so my eventure took shape. Friday, I took off solo into partly sunny skies that turned cloudy and then released a steady drizzle from around 15 miles on. This worked in my favor, as the temperatures remained warm and the dreary day cleared the towpath of most people. Pretty much me and the squirrels out there. Leaves fell gently in front of my path and drizzle moistened my arms and glasses, but it wasn’t so bad. Falling leaves actually create a romantic atmosphere until a few smack you in the face. Ouch. I plodded steadily to Harper’s Ferry, knowing I had a full day to complete just under 70 miles. I did not want to wear out my legs, as I had 26.2 miles to run the following day. I stopped several times along the way to take photos. The bright hues of freshly fallen leaves were too enticing to not photograph, despite the dreary lighting. Felkerino met me that evening, doing his own concept ride. He left after 6:30 p.m. from D.C. and arrived in Harpers Ferry at 1:15 a.m. after enduring a lot of steady rain, indeed, what some might call downpours. Darn randonneurs, they’ll ride anytime, any weather (eye roll)! Saturday’s marathon came and went, and my body felt pretty good throughout (a separate post about that later). My time was slower than my normally slow pace, but knowing that I needed to ride 67 miles the day after completing the marathon I never pushed my effort. Our Sunday return was much less painful than I imagined it would be, and it was a glorious day. The clouds cleared on Saturday afternoon and sunny blue skies remained for Sunday. Temperatures had dropped into the 30s overnight, our first cold overnight of the season. 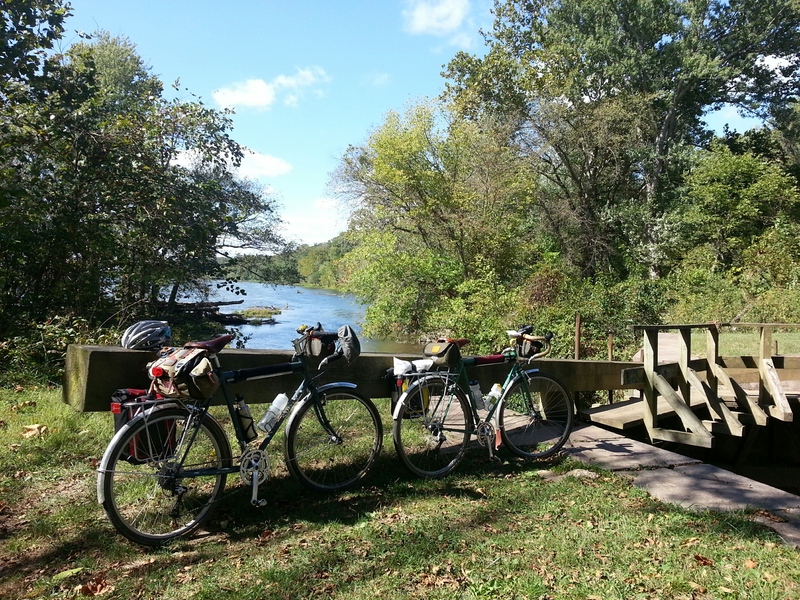 I was so glad to be riding the C&O towpath. I did not have to worry about paying constant attention to car traffic, and the lack of stopping and starting at intersections was a benefit to my tired legs. 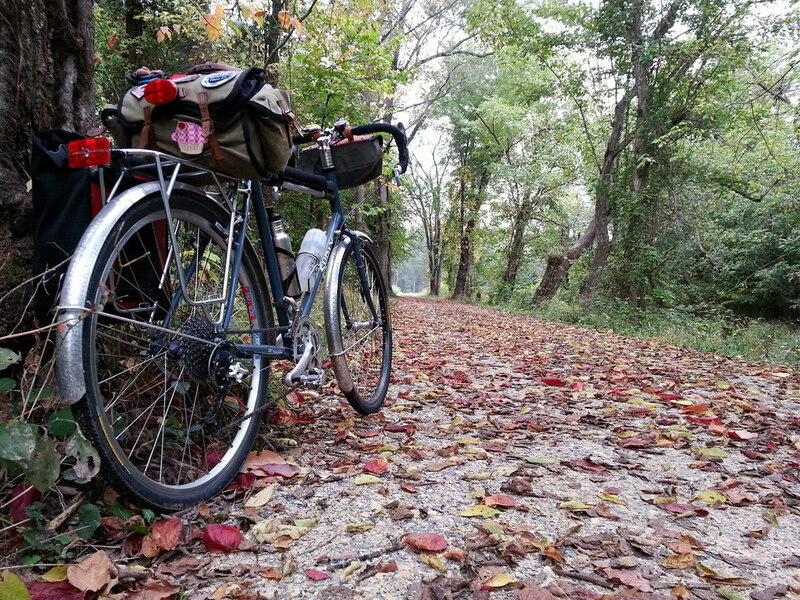 The C&O is a special place to ride, especially in the fall. The canal’s locks and neighboring lockhouses remind me of all the comings and goings the C&O has seen since it was first built in 1828. 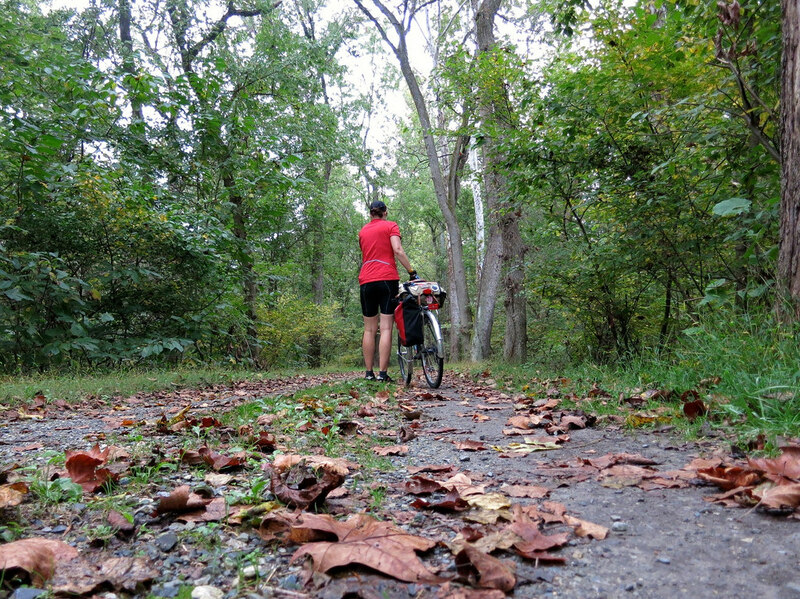 Tree colors begin to turn, and the crunching of leaves under bike tires tell you that time is passing. 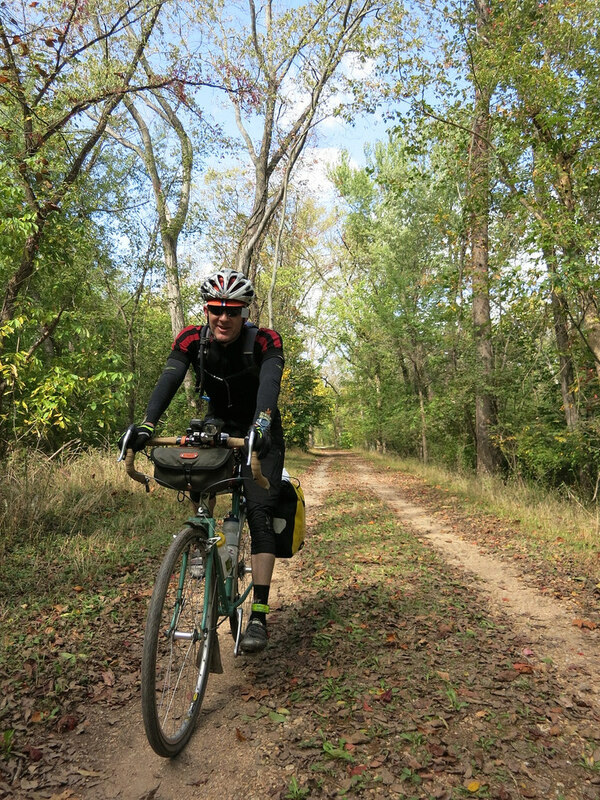 I don’t aspire to duathlons or tris, but I loved combining transportation cycling and bike touring with my running. I am so glad to have made this eventure happen, grateful for Felkerino’s support and encouragement, and proud of my body for its durability all along the way. I’m still envious of your eventure, even though I’m glad I didn’t attempt the ride out or back in light of my legs protests during the marathon! Great to toast our victorious finishes with you and Felkerino! Very impressive fitness feat. Usually its a good idea to taper before a marathon, and certainly the next day the legs are “interesting” to work with. But heck, what do those coaches know? 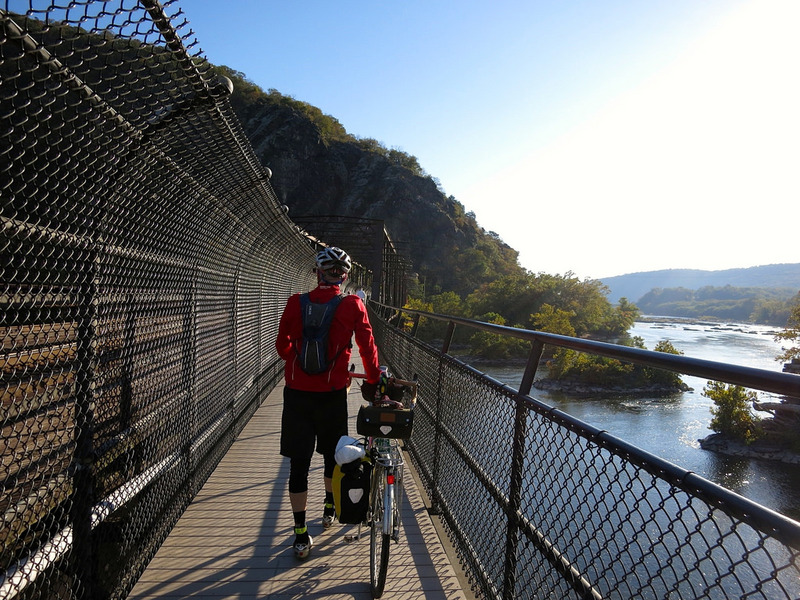 I definitely am inspired to get out and ride the C&O to Harpers Ferry and this time of year seems perfect idea. This is exciting, I’m starting my GAPCO trip next weekend and spending the day making packing lists and figuring food stops along the way. That was a truly awesome weekend and not bad for a self proclaimed non athlete. Good to see the LHT again also. I am very glad you enjoyed your mini-tour / maxi-thon! I too am feeling bit weary of automobile traffic. Your post has inspired me to dust off the mountain bike and do a loop of Michaux this weekend if the weather is halfway decent. Must remember the Trangia, coffee and camera!